cats, her kitchen and baking. The image is called "Aurora - little baker and love kitchen." and its from the East Wind. and my other new favourite... I got it in the USA a few weeks ago - paw prints. as soon as i saw it, I had to snap it up! I added a red punched border and the image was matted and layered. The flowers are so lovely.. from docrafts and the little tag is from craftwork cards. On the original image, the little frame "hanging" at the top of the image, says "LOVE"
but I wanted to say MUM somewhere on the card..
snipped a little piece of card to fit and handwrote the letters. The herat diecut is from menmory box. 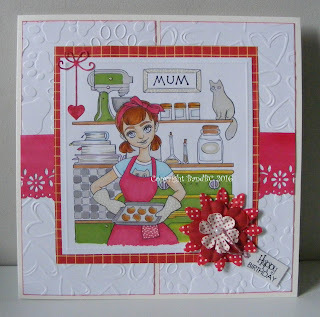 Bet your Mum will love this - I do! What a perfect card for Mom! I love the embossed background and how you colored the image. Thank you for joining Jo's Fun Friday Challenge. Lovely make. Thanks for joining our challenge at Crafting From The Heart. Aww, what a perfect card to Celebrate Mom. Love the beautiful image and the fun card design. Thank you for playing along with us at Crafty Gals Corner. Very cute, I like the color and the embossing is a nice touch. Thanks for sharing with us at 4 Crafty Chicks. Could you please link our challenge to your list. Thanks, and great job! This is a fabulous image and love the embossing. This is so beautiful card! Love this image - your mum will love it! Wonderful design and great embossing! Thank you so much for sharing this beauty with us at Fussy and Fancy Friday challenge. Good luck and hope to see you next time too!